Today, the Mumbles weather is at its capricious best. For the past two months, or more, the stalwart villagers have endured a cruel winter, inflicted upon them, according to our many local experts, as a result of ‘global warming’. But! Eighty years ago, all winters were like this! There was occasional snow, winds blew, taps in houses froze, there was ice on the inside of the bedroom windows, the river at Blackpill could be walked across and, occasionally, the sea froze on the front. This was accepted as the norm and hardy village lads continued to go to school in short trousers (plus, of course, shirts and coats) acquiring chilblained hands and chapped knees in the process, all of which went totally unheeded. One must hope that the weather will continue to behave, as it used to, and that March will, “come in like a lion and go out like a lamb” with April, bringing its showers and teasing promises of balmier weather to come. As a youngster, eighty years ago, I lived through Easters which were invariably cold and wet, relieved only by the odd sunny, chilly day. The only thing to do on a Bank Holiday afternoon was to go to the “Old” Cinema where the main film was always a British comedy, featuring northern comedian, Sydney Howard. However, there were advantages to this type of weather and the Swansea Corporation would seize the opportunity of resurfacing the back streets of the Borough. The simple technique, then employed, lent itself with optimal ease to the ambient temperature at this time of the year. Usually, every other Spring, there would be a visit by the road workmen from the Corporation to renovate the road surfaces, keeping them in fine fettle, with a pot hole being as rare as an unblocked drain is in Mumbles today. They descended upon us without warning! Some time during the Easter holidays, we would be awakened by the sound of shovels clanging, banging and dragging on the road surface. Loud irreverent ribald shouts, interspersed with laughter, would rent the crispness of the early morning air. Long before the residents had sat down for breakfast, they were preparing to toil. Indeed, they were early starters in those days! Children rushed to peep through the curtains, , . Instead of the usual, thorough five-second wash, my morning’s ablutions were perfunctory, to save time. Terrified that I was missing out, I bolted my porridge, tore down the stairs and out into the street. My home, the Victoria Inn was halfway up Gloucester Place and I could see that the main activity was still at the lower end, in Albert Place. I had missed nothing! Already the street was beginning to fill with excited children, anxious to witness this great event and to be involved in what would follow. We allowed guests from Park Street and Woodville Road to visit (on the understanding that there would be a reciprocal arrangement when their patch of territory was likewise serviced). There was the usual early morning Spring nip in the air and although well wrapped up, noses ran copiously, necessitating frequent wiping on one’s sleeve (soon to be more gold-encrusted than that of an admiral’s). All the lads were wearing the customary short trousers disregarding the cold with manly contempt. Simple though the modus operandi was, it was executed with method and efficiency under the direct supervision of the “gaffer” or foreman. Whilst all the workmen were attired in heavy work stained clothes, huge studded boots, knotted neckerchieves and battered caps, the gaffer wore a blue, serge suit (slightly dusty in parts) and a bowler hat. He stood apart, was very much in charge and did not have a half-smoked Woodbine tucked behind his ear. First came the sweepers, half a dozen or more, armed with massive, stiff bristled brooms, literally sweeping all before them and raising clouds of choking dust. Then came the “scratchers and pickers” who, laboriously, etched the surface with their picks to provide “a key”. Meanwhile, the street continued to fill with children of both sexes, who lined the sides, sitting on window sills or standing in doorways- it was beginning to get exciting, reflected in the build up of noise from the chattering, squealing and laughing youngsters. A piece of equipment, towed by a horse, made its way up the road. This gangly piece of equipment looked extraordinarily like the picture in my encyclopaedia of Stephenson’s Rocket. A tall, dignified funnel belched black smoke and, below, between the large spindly spoked wheels, live flames could be seen licking the underbelly of this creature of Hades. We kept our distance from this fearsome monster but revelled in the spectacle, and inhaled the indescribable, but gorgeous, smell of molten tar. One workman slowly led the patient nag up the street, another fed the flames of the boiler whilst a third, carrying a long metal rod sprayed molten tar upon the prepared surface of the road. This latter gentleman, a frustrated comedian, would occasionally make a playful lunge with his spewing wand at the viewing children, eliciting screams from the girls and muttered oaths from the disdainful lads. Almost immediately, two toilers following would throw shovelfuls of small sharp stones, ferried to them in large barrows, upon the glistening surface, these were more evenly distributed by a pair of rakers. Now for the climaxing event! We could hear, and then see, the approach of the star performer. As in a bullfight, the Picadors, the Banderilleros had had their moment, now came the Matador! Forging up the road, huffing and clanking, came the magnificent steam roller with its highly polished, green and black shining boiler, divided into partitions by gleaming brass hoops. One huge roller crunched and clamoured at the front, harnessed by two chains and dripping with water. At the back, two massive wheels provided the driving force. Yet another wheel was mysteriously rotating at the side of the boiler. A tall black stately funnel, echoing a bygone day, ejected smoke and sparks whilst, directly behind it stood a quaint little gadget of metal balls, rotating on a vertical axis, at speed. When asked, my father told me that this latter device was “a governor”. I was none the wiser and, some time later, when told that Swansea Jail had acquired a new Governor, I thought that when I went past the Jail, I would see a ball device rotating on the prison roof, no doubt to entertain the incarcerated, bored inhabitants. For many years, as I passed the jail in the Mumbles Train, I would search for a glimpse of “the governor”. Once when asked why I was looking at the Jail roof with such intense interest, I replied that I was looking for the governor spinning on the roof. I was never asked that question again and people started avoiding me. Mounted on the rear platform was the driver who steered this panting, steaming leviathan, by operating a pair of brass wheels. Back and fore he went, skirting doorsteps to within a fraction of an inch. Such skill! Such precision! Such showmanship! How he played up to his young admiring audience! 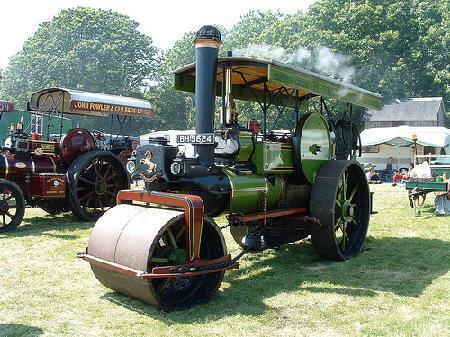 There was great affection for the steam roller, not felt for the sinister black tar machine. This mighty beast with its huffing and puffing, its clanking and crunching, stimulated a response similar to that felt for the steam locomotive, almost as if it were a living creature. We stood back, welcoming him to our street but cautiously and with awe and respect. He progressed relentlessly, up the street, bedding the sharp stones into the soft tar and leaving behind a host of smells, of burning coals, hot oiled machinery, smoke and steam. On one side of the cab, a gleaming ovoid disc proudly bore the name ‘INVICTA’, beneath which was a large number. This number, of course, gave the roller its unique identity, the identity of a hand made machine made in one of the finest engineering factories in the world- here in Britain. It is incredible to think that within only a few decades, these manufacturing skills had all but disappeared. The Tar Men carried on up to the top of the road, turned the corner and disappeared into the hinterland of Overland Road. Tomorrow was another day for them, with a performance in another street. with audience participation! This was an old Mumbles tradition, practised in every Mumbles street, once the Tar Men had gone. Armed with little twigs, we descended upon the street surface. We sought out little uncovered islets of the still soft tar and dipped in our sticks. Carefully pre-selected areas, on the ubiquitous limestone walls were then adorned with our initials. Children, everywhere were kneeling, crouching or standing up, leaving their marks for posterity, just as cavemen did, thousands of years before and the higher up the wall, the better the quality of the script. To this very day, a keen inquisitive eye, running along any of the old limestone walls of Mumbles will still be able to discern a little surviving fragment of this history and it is not difficult, when a set of faded initials is discovered, to imagine a little lad, nearly a century ago, on his knees, laboriously inscribing. He would have been a real Mumbles boy! The day would end as cold darkness fell, the Tar Men had been, initials had been traditionally inscribed and it was home, to have the sticky tar caked fingers, and knees, cleaned with the help of a little turpentine and Lifebuoy soap. Sore knees, sore hands but a feeling of satisfaction. There are always offshoots to any story and there is one to this. I recall when I was about five years old, that the Tar Men had left copious amounts of the little chippings at the side of the road. Armed with an empty Hartley’s stone jar, I proceeded to collect these stones and bring them into the house. My mother was standing on the doorstep, talking to the elegant Mrs. Ken David from Overland Road. Mrs. David passed comment on my activity. My mother reassured her that I had not lost my sense of reason (well, probably, not) but was amusing myself in a sweet, innocent little five year old way. I continued the cartage for the greater part of the day. That evening, my father came home from work, as ever, very tired. His day started at six o’ clock am and after a short rest, he was faced with having to open the pub at five-thirty pm, for the evening’s trade (such as it was in those days). On this particular evening, as with all the others, he ate a large cooked meal and, before resting his head, retired for a leisurely session in the outside, downstairs toilet. This was his own private and personal domain, with a little bit of carpet, electric light and peace and solitude. He took with him his Evening Post and had no reason to think that this particular evening would be different to the scores of others. What better way of unwinding? He entered the Ty-bach, shut and bolted the door, turned and switched on the light. A cursory glance assured him that there was an adequate quantity of old, old Times newspapers, ready cut and impaled upon a butcher’s hook. I believe he preferred to use the Times because of its texture and, also, as a political gesture. He couldn’t help notice the headline on the top sheet and muttered to himself, “Pity about the Titanic”. For the rest of his life, my father never forgot that moment. Instead of alighting upon the familiar, comforting oaken seat, polished by contact with generations of noble inn keepers’ hindquarters, he made instant and agonising contact with a pile of little jagged stones, lying aggressively in volcanic form. “Lemme get at him! Lemme get at him!”. Fortunately, he was in no shape to move and my mother helped him into the house. She then ran out into the street and bribed someone to take me up to my Grandma’s house in Brynmill. This house was to become a sort of sanctuary for me when I was in trouble. I stayed there for a week, or so, before being allowed home. My mother persuaded my father that decapitation was not the answer, ”… it would make the neighbours talk” and, besides, she had just bought me a new cap. Some sort of compromise was reached and it was decided to send me to a boarding school in the upper Amazon Basin area. Unfortunately, they refused to accept me. Something to do with them being a peace loving nation. Eventually my father forgave me but refused to sit in my presence (actually he did not sit anywhere for some considerable time). However, he was too big a man to carry a grudge and I remember how, eventually, he shook hands with me on my birthday, to demonstrate his full forgiveness- (I think it was on my fortieth birthday). Physically he was scarred for life and described the wounded area as looking like an Eynon’s crumpet. ………………….. It seems today, that with the ridiculous load of traffic allowed on our highways and byways, that we are never going to see our roads maintained to the standards of those old days, in the thirties. All we can hope for now is speedy, patch up work. So! Gone forever are the days of the Tar Men, with the ensuing joys of watching them and then inscribing initials on the old limestone walls of Mumbles . Another lovely old Mumbles tradition gone.